The Polar V650 bike computer is a smart compantion for every training session. Thanks to most varied functions (including GPS and altimeter/barometer), you can create and analyse your training via Smartphone or Tablet. 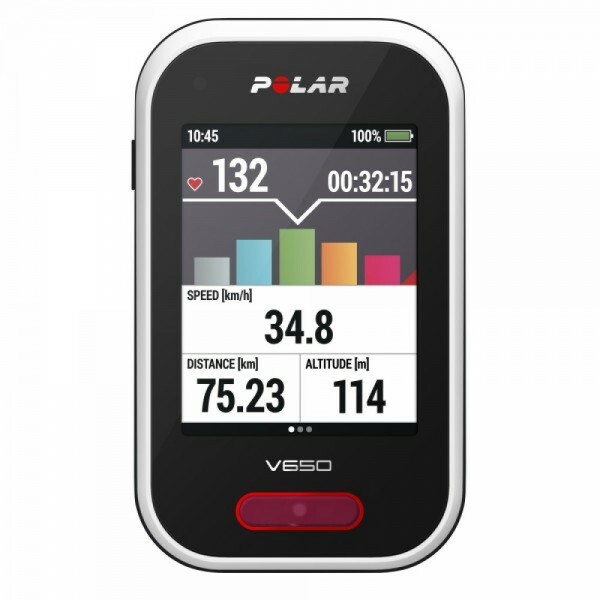 The V650 bike computer of Polar is smart companion on every tour. Easy use meets most advanced technology. Thanks to integrated touchscreen, GPS, and altimeter, you are always best informed about training levels and current tours. All important data of the tour are displayed on the 2.8 inches big touchscreen. There are almost no limits in creating the training with the V650. Either exercising in pulse zones or doing a training based on speed – it is possible with the stylish bike computer. The bike computer can also be used at dusk or when it is dark outside thanks to the integrated LED light. Besides GPS functions and barometer functions, the V650 also provides important basic functions (heart rate measuring, Polar OwnCal, and automatic determination of target zone) in addition. Create your training on your Smartphone or Tablet pc and quickly transmit the training analyses.